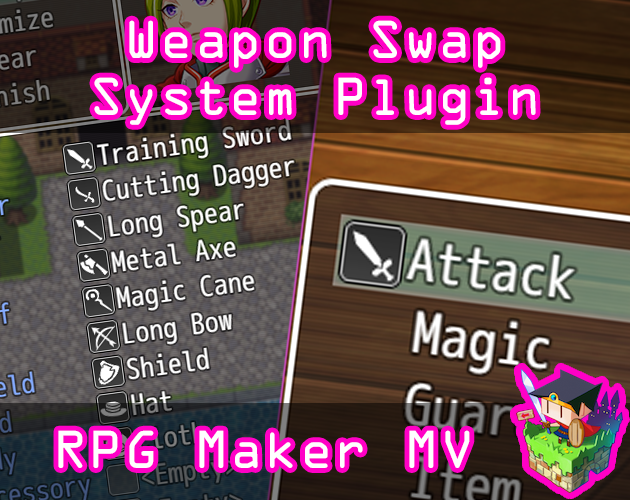 This is a RPG Maker MV plugin that will give your game's actors the function to swap weapons in the middle of the fight. 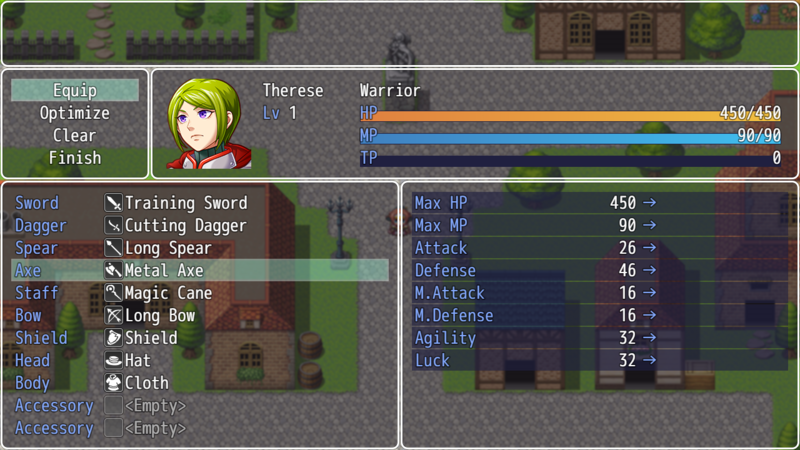 Up to one of each weapon type can be equipped at a time and they can be switched out each turn. Swapping weapons can let the player team adapt to certain situations better or giving them the ability to hit certain weapon weaknesses in battle. This plugin changes both something inside battle and outside of battle. The Attack command option can now have the weapon being used swapped by pressing left or right (if that option is turned on). Some skills can also automatically switch to a weapon when it starts being used. The other change is in the Equip menu. Instead of having only a single weapon slot, there is now one weapon slot for each of the weapon types. Each actor can equip a weapon of that type into those slots if they can use those weapon types. There will be a warning though. This feature does not work with the Dual Wield system so it is disabled in order to be able to swap weapons. Some plugin parameters require your attention. Please read through and configure them to customize weapon swapping for your game. Show Command? : Show the Weapon Swap Command in the Actor Command Window? Turn this on if you are making your game for mouse control because there is no other way to switch weapons without using the arrow keys. Use Arrow Swapping? 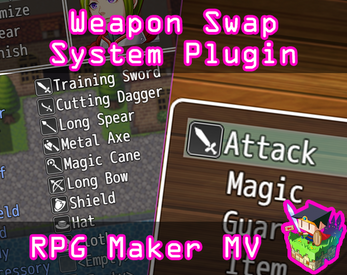 : Use Arrow Keys to control weapon swapping? If on, then pressing left or right will switch the weapon currently equipped in the order of the Weapon Types list in the Database's Types tab. Show Swap Arrows? : Shows arrow sprites next to the Attack command to tell the player that pressing Left or Right here can have an effect. 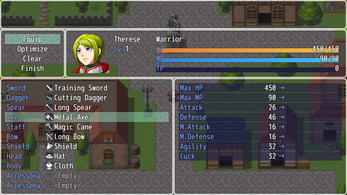 Battle Test Weapons: During battle test, equip each party member with one of each weapon type. The weapon selected will be the first available one in the database unless they already have that weapon equipped. Show Battle Icons: Show icons of currently equipped weapons in battle? This will show the icon next to the Attack command, making it easier for the player to know which weapon the actor has currently equipped. Show Battle Action: Show animation of actor switching weapons? This is for sideview only. When weapon switching is done during Attack switching, the actor will perform an attack motion to display the weapon it is currently equipped with. Extend Equip Stat Window: If you are using Yanfly's Equip Core, this will extend the stat compare window to have Hit Accuracy, Evasion, and Critical. When the actor uses this skill or item, the actor will switch to this weapon if it is equipped when the skill cost is paid. x is the weapon type ID and text is the weapon name. If you use the weapon name, type it out exactly since it is case sensitive. This notetag does not make the weapon a requirement. To make it a requirement, use the database's "Required Weapon" dropdown lists to enforce the requirement. Requires any kind of weapon to be equipped in order to use it. Insert multiple x to add more weapon types. All of the weapon types must be equipped in order for this skill to be used. 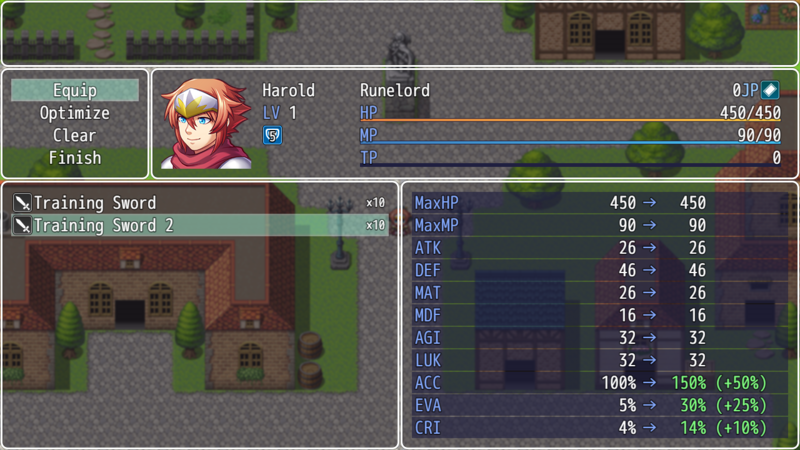 Use x with the weapon type ID in the Database Type tab. Or use text and replace it with the name of the weapon type. If you use the name of the weapon type, type it out exactly as it is spelled because it is case sensitive. Sep 11 2018: Bug fix for Optimize and Clear weapon. Should be fixed now. Added a new parameter: Show Swap Arrows? Sep 18 2018: Add fail safe: battle test will not provide weapon types that don't have weapons made for them and give you a warning. Sep 23 2018: Bug fix for Battle Test Weapon. Can now be turned off.